Long path or short path HF propagation? Past months propagation improved with nice HF propagation. Those who have DX ears must have noticed that 10m long distance propagation acted in a more or less remarkable way. Fellow DX’ ers on forums reported signals with multiple echoes that are certainly not from a CB echo mike. Some say it must be a signal that travels all around the globe that causes the echo. Well, it’s all got to do with short path, long path and chordal hop propagation. I will try to explain. Let’s pretend we have two stations making QSO on 10m, PA9X near Rotterdam and imaginary station VK5ZQZ down in Adelaide. The solar flux is high enough (140) and K-index low enough (1) to allow propagation between the two stations. We are making a nice QSO, I have got my antenna directed at 70° bearing and he has got his antenna directed at 340°. The signal follows the shortest path with a distance of about 16,500km from The Netherlands across north east Europe, Asiatic Russia, China, south east Asia to Adelaide. It hops between the F2 layer, which floats between roughly 250-400km altitude and the Earth’s surface. Using F2-layer propagation one single hop can do a distance between 1800km and 3500km on 10m. So for the complete path to Australia, the signal makes about 5 to 6 hops. With each hop, bouncing off the Earth’s surface, there is significant signal loss, especially bouncing of land. But there is another path, the long path. The long path runs the other way around the globe. Starting from The Netherlands, along the Azores, Atlantic Ocean northern Brazil, Peru, Pacific Ocean, across New Zealand’s Southern Island into Sydney, a distance of roughly 23,500km. The long path to Australia would be 7 to 8 hops in theory. But but why are long path signals sometimes remarkably stronger than short path signals when they make more hops? Could be that because the long path runs mainly over salt water, but this only counts for this specific situation. But there is more going on, a propagation mode that is believed to responsible for long path propagation with strong signals is called chordal hop propagation. 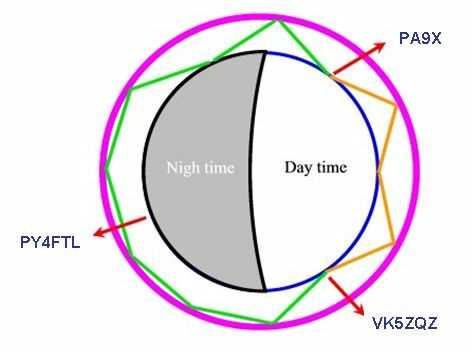 Chordal hop propagation is a propagation mode involving the daylight F2 layer and night time F layer. At daytime there are two upper layers in the ionosphere, the F1-layer at ± 150-200km and the F2 layer at 250-400km. Shortly after sunset these two layers merge into the F layer and split up again into F1 and F2 layer at sunruse. During night time the F layer loses it’s ionization density, and it’s ability to reflect signals back to Earth. But sometimes the F-layer is just dense enough to reflect the signal back, but with a less steep angle, causing the signal to be directed to another part of the ionosphere thousands of km’s ahead, not touching the ground. Here is a picture I have drawn to visualize. The purple line represents the ionosphere, the orange line the short path and the green line the long path. A part of the green line is chordal hop propagation, there where the signal does not touch Earth’s surface but reflects of the F-layer. With chordal hop propagation you have much less attenuation due to the fact the signals does not reflect against Earth’s surface. In this occasion the signal that uses long path propagation arrives at the other station with much less attenuation, thus with a stronger signal than the short path. one Funny thing is that a station at night time, like imaginary station PY4FTL has signals travelling above him along the ionosphere, but he cannot receive them. There are also scientist that believe that chordal hop could be the result of signals that travel between the F2 or F layer and a sporadic-E layer. One more theory is that a signals travels within the F2 or F layer in an kind of duct for thousand of km’s. These many “components” all add up into a sometimes spectacular combination of echoes. In one rare occasions I received an S9 signal. It had so many echoes that it was barely readable, an R2/S9 report! In another occasion I received a station from Moscow via the long path (37,800km) while the short path signal (2,200km) did not appear to be present at all! Long path and chordal hop propagation are beautiful phenomenon that not too many operators on 10m band know how to take advantage of. Hope this post will help. This entry was posted in Propagation and tagged chordal hop, HF, longpath, pa9x, propagation, shortpath by Jean-Paul Suijs - PA9X. Bookmark the permalink. ← Previous Previous post: Has Solar Cycle 24 finished?